Can you imagine not brushing your teeth? Skipping one brushing, let alone hundreds, is enough to send germaphobes into overdrive. Well, most pets go their entire lives without daily attention to their teeth and gums. The result? Periodontal disease, abscesses, infections, and systemic illness can diminish overall health, wellness, and longevity. Even pets well into their adult or senior years can get a new lease on life when dental issues are addressed. Just like us, pets need time before accepting certain actions. For some, it could be nail trims; others balk at bathing. Pet dental care is an important duty of being a pet owner, but good habits can take weeks or even months to establish. The concept of pet dental care can be foreign to many, but you and your pet will eventually get used to it. In fact, over time, you might both enjoy it and see it as special bonding time. 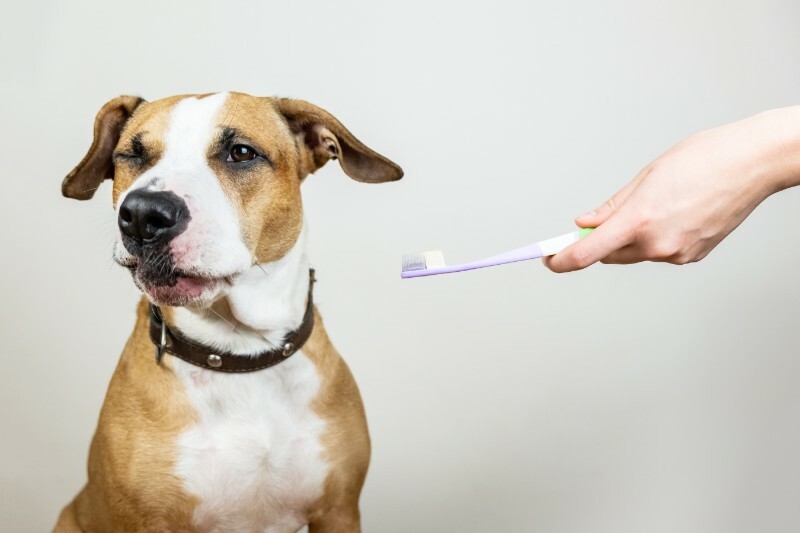 The key is to approach brushing your pet’s teeth slowly but resolutely. Remain patient, and do not give up. Stay consistent, and don’t waver. Before long, everyone will be on the same page. There are lots of different toothpaste flavors out there. You might end up sampling a few before landing on something your pet truly enjoys, like beef, bacon, or poultry. Start out with a pea-sized amount on the tip of your finger. Once accustomed to the taste and texture of toothpaste, you can attempt moving your finger inside your pet’s mouth, softly rubbing against the teeth and gum line. Try using your finger, gauze squares, and/or specialty pet toothbrushes (just be sure they fit inside your pet’s mouth without pain). Along the way, offer loads of accolades, head scratches, or back rubs. Pay close attention to the back molars, ensuring they receive a healthy dose of circular brush strokes. Before you know it, your pet’s healthy habit will have a strong foothold in your daily routine. Plus, providing good pet dental care means your companion is given every opportunity to live a long, happy, healthy life. In celebration of National Pet Dental Health Month in February, take advantage of our 20% off dental cleanings discount! Call now to book your appointment in February to qualify for this offer – (630) 530-1900. As always, The Pet Experts are here to answer any questions you might have. Please let us know how we can help!